Assignment for "Tangible User Interfaces" course, Fall 2014. Earth Scope is an interactive globe designed to teach adolescents about Earth's geology. Users tap the part of the globe they are interested in and learn about the geological history of that place. Earth Scope then plays videos about past and present geological events in the selected region and vibrates to simulate activity like tectonic plate shifts. As they push a telescope deeper into the earth, the videos change to reflect the history of Earth's deeper layers. Earth Scope encourages children to explore the earth's layers. It helps them to understand geological history and how it has shaped what they can (and cannot) see. Earth Scope went through several iterations. In the first version, it was a globe helmet that simulated the experience of visiting foreign cities. This meant including sights, smells, and sounds. The concept was that users would tap on the outside of the globe to pick a city, then put their head inside to experience the place. We built our first prototype from a piñata and tissue paper. We used Google Cardboard Street View to simulate what it would be like to walk through the streets in Paris. We also had headphones to play Parisian street noise, a tea ball with spices to simulate the smell, and a hair dryer to blow on users if they "visited" a warmer climate. Based on feedback from a demonstration to our class, we decided to adjust the project topic and improve the logic of the interactions. For the second prototype, we changed the project's focus to support intuitive interactions with the globe. 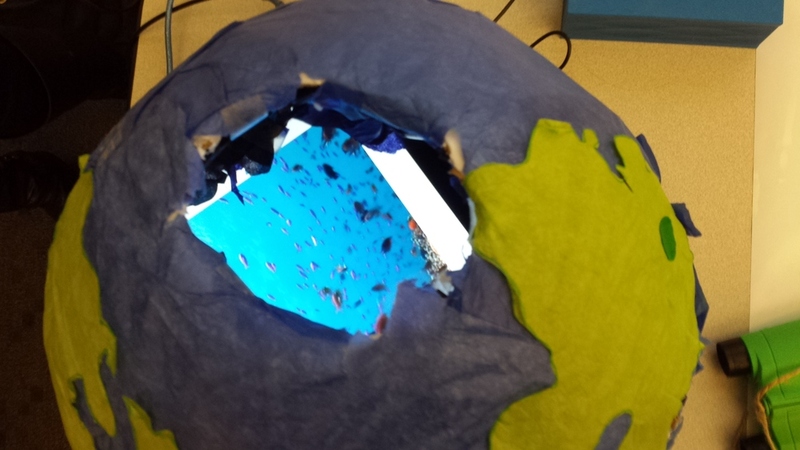 Our project involved the user putting their head inside the globe, so why not focus on what the project could teach people about the inside of the earth by peering into it? We shifted the project's focus to geology. In this version, the concept was that users could tap on the regions like the Himalayas to see how they formed, edges of countries to learn about Pangaea, and so on. On the left, the user views a video about the center of the earth. On the right, they pull the telescope out towards the surface and learn about Earth's crust. For the implementation, we used an Arduino, force sensitive resistors, an accelerometer, a tablet, Processing, Python, and paper (the globe itself). The force sensitive resistors were placed on the outside of the globe to trigger different videos depending on the region tapped. The tablet was inserted into the globe and played the videos based on input from the FSRs via the Arduino. The accelerometer was used to simulate a seismograph based on tectonic activity. We used Processing, Python, and the Arduino to control the video switching. We tested the prototype on a dozen classmates who came to a project showcase. They were immediately interested in the globe, but had some trouble connecting the seismograph to the activity. The prototype also didn't take advantage of the Earth's depth to teach. Another important insight from watching people use Earth Scope was that people wanted to tap and release on areas of interest, not tap and hold. We had thought that users would press and hold for as long as they were interested in the associated video. Rather, the majority of users tapped a hot spot on the prototype and expected the video to play until the end. They expected to tap on another hot spot to stop the current video and start the next. For the final prototype, we had two primary interactions in mind: Tapping on the globe to pick a region of interest, and pushing a pair of binoculars into a hole at the top of the globe to change which layer of the globe the videos focused on. We removed the seismograph and focused on having videos as outputs. Due to time limitations, we had to limit the scope of the current prototype. Rather than the entire surface of the globe being sensitive to touch, we implemented “hot spots” on the globe. When users touched a hot spot, the prototype would play location-specific videos about tectonic plates. In the initial prototype, users also simply looked through a hole in the top of the globe to watch videos instead of using a telescope. We had an accelerometer to sense when the globe was being shaken. However, we have not yet implemented depth sensing using a gyroscope. In a later iteration, a child could stick a telescope with a gyroscope attached to it into the top of the globe. The gyroscope can sense how far into the globe the telescope is. Based on the gyroscope’s reading, the Earth Scope will play an appropriate video about that layer of the Earth. Based on how a group of adults interacted with the Earth Scope prototype, we have identified several features that would improve the experience of using the tool. An important part of learning is engaging with other students. Adding additional viewports would allow multiple students to enjoy Earth Scope at the same time. The student holding the telescope would control the layer of the Earth being examined. Other students could tap on the surface of Earth Scope to dictate which region the group learns about. Using the shape of the globe, we will show the impact the shaking has with multimedia of how the inside of the Earth changes with shaking movements. This will also demonstrate that even though the Earth is in one piece, inside the “pieces”, such as plate tectonics, have shifted and have affected the overall skeleton of the Earth. To gain a deeper understanding of the interior layers of the Earth, a vent on the globe would blow hot air. The temperature would increase as the telescope goes deeper inside the Earth, towards its magma core. This feature would show that there is a difference between the surface and interior layers of the Earth. In the initial implementation, this can be done by Wizard of Oz method: a prototype demonstrator would manually adjust the temperature setting on a small heater inside the Earth.